In the Middle: A Fourteenth-Century Ecology: Chaucer's "The Former Age"
This post deserves a fuller response than I -- with one foot out the door for a Huge Trip and one finger on the keyboard trying to complete what I need to so that I can depart -- can give it. So I will just say (1) this is great, thoughtful stuff. The analysis and the conclusion is wholly yours: quite original, and makes me see the poem in a new way. (2) I'm interested in how the Former Age as a medieval space of prehistory works. Only as a thought experiment inherited from antiquity, and therefore a place of safe play? It can't be harmonized with the biblical vision of prehistory (the antediluvian), so what's its status as a temporality? A realm for speculation unmoored from "real" time? Or a temporal possibility that co-exists uneasily with the biblical narrative? 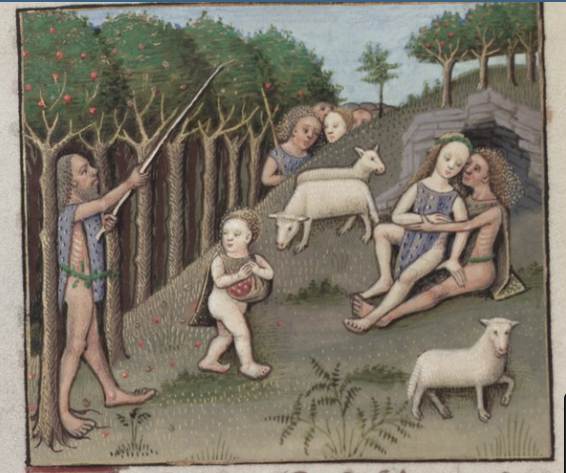 Your wonderful post, and your use of the Golden Age from the MS Douce manuscript of the _Roman de la Rose_, prompts me to rethink the character and placement of the Golden Age discussion in Jean de Meun's text. It spends a lot of time on the food (one could talk of delicious longue durée), and the springtime is eternal, and there is shelter from storms, and (repeatedly) no laws or kings. But the beauty of the Golden Age is undermined by its immediate juxtaposition with the graphic and horrible Jealous Husband scene - supposedly to illustrate how far we've fallen with our laws and strictures, but my students (and I for that matter) can never "get over" the violence and the spite to the moral message of contrast. "(And what happens to you ethically if you do get over it?) The juxtaposition of Golden Age and Jealous Husband itself comes within the incredibly problematic (because should _any_ of his advice be followed?) Advice of Friend speech. The other mention of the Golden Age appears in Reason's earlier arguments with the Lover - the philosophical debate that implodes when the Lover is shocked and deterred from discourse by Reason's use of the words "balls" (she'd been describing the demise of Saturn's "couilles" which brought about the end of said Golden Age). In the Roman, the Golden Age is made conditional by what frames it in the poem - while textually self-contained as a remembered story by the speaker, it is conditioned by the experience of the reader in these problematic (violent, comic) juxtapositions. Your wonderful work on this makes me wonder about the "stand-alone" quality of Chaucer's poem, and has made me very excited to think further about the effect of the description of Golden and Former Ages. I'll be teaching an "Ecology of Medieval Art" course next year and _can't wait_ to use your book, and, now, this, and what will come of it! It's a refreshing change from the naive environmentalist invocation of Eden. But I want to think about how hunger and vulnerability work against, rather than towards, such sympathy. Especially after that Derrida interview you linked to. Other forces, notably ideology (here I'm thinking of St. Eustace) can help to maintain an equilibrium that would otherwise be intolerable, but these carry their own risks. Your reading of "The Former Age" makes me want to read it (which is no small feat) and I look forward to the impending dressing of The Canarien. Jeffrey: great questions. I feel as though I've found SOMETHING somewhere about efforts to harmonize the Golden Age w/ Eden, but I can't remember where. I wonder if the difficulties in that lead to making the Golden Age geographically rather than temporally distant (where the Brahmins and the Canary Islanders for example live in prehistory). Anne: thanks, please do share you syllabus with me if you can, and if you're still here! I know I'm borrowing from your reading this Wednesday, when I teach the RR Golden Age alongside Dindimus and Chaucer. Alex, "hunger and vulnerability work against, rather than towards, such sympathy": exactly, yes, well put. Here's the problem: we have to eat. There's no way around that. And that eating has to be a moral challenge to us. I love that the Golden Age tradition, in its best forms (the Dindimus material and Chaucer's FA), don't shy away from the human misery that would result from a life of radically trying to do right by all. Very interesting ... I also wonder about Nimrod's (builder of Babel) inclusion at the end of the poem. As you say, it seems Chaucer may be fantasizing about a world without people - does the inclusion of Nimrod reveal a kind of lamentation over the nature of language as well? Reid, I'd say YES. I hadn't considered that, and sadly (?) the article that this post was leading to has already appeared here. If I ever revise this for a book though, I'll include that idea and properly credit you.